White Valley is the area covered by Electoral Areas “D” (Rural Lumby), “E” (Cherryville) and the Village of Lumby. White Valley Parks, Recreation & Culture is governed by the Regional District of North Okanagan through the White Valley Parks, Recreation and Culture Advisory Committee (WVPRCAC), whose membership includes one representative from each of the three jurisdictions. 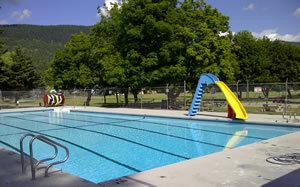 The Village of Lumby provides all parks and facility management services under contract to Regional District of North Okanagan. These include the White Valley Community Centre, Pat Duke Arena, Lumby Curling Club, Oval Park and Royals Park. To view the WVPRCAC meeting minutes and agendas please click here. Schedule of Fees for Whitevalley Parks, Recreation and Culture. 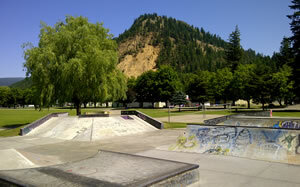 White Valley Parks, Recreation and Culture is managed through contract by the Village of Lumby. Explore the Salmon Trail while in Lumby. These scenic trails follow the Bessette and Duteau creeks, the easternmost spawning grounds of Pacific Coho and Chinook Salmon. There are three trails connected via downtown streets. Each trail has information, art and activities on varying themes. The environments you find along the trails range from the Cottonwood riparian habitat to the industrial land that is indicative of Lumby's association with forest products. The trails are a first step towards developing a harmonious coexistence between industry and our natural environment. The Lumby Visitor Centre offers free Salmon Trail tours from June to August. Join our student guides on an informative and beautiful stroll through the Lumby Salmon Trail. Walks as short as 1km and as long as 8 km are offered on terrain that is flat and accessible to wheelchairs, prams, and bicycles. To get the most out of your visit, start at the Visitor Centre where you can obtain a trails passport and a childrens activity guide or even request an educational guided tour. Your leashed pet is welcome and doggie bags are provided. In 2013, the municipality adopted the Salmon Trail Maintenance Policy that allows the preservation of the Salmon Trail to remain in its natural state. Just in time for Lumby Days, the White Valley Spray Park and outdoor fitness equipment opened to the public on June 7th, 2013. This project was made possible through funding from the Province of BC’s Community Recreation Program, as well as community donations from the Lumby Lion’s Club and a local non-profit, Teddy’s Devils Martin’s Angels. Hard work by the Village of Lumby staff ensured that the park was ready to open in time for their annual celebration. The spray park will be open from May long weekend to September long weekend, 10 am to 7 pm, and on September weekends only, from 11 am to 6 pm. Free introductory classes for the fitness equipment will be available soon through the White Valley Community Centre. For information about the Lumby Curling Club click here.